In 1971, an internal crisis in Pakistan resulted in a third war between India and Pakistan and the secession of East Pakistan, creating the independent state of Bangladesh. These events altered the relationship between the United States and the region. The partition of India in 1947 created West and East Pakistan, two noncontiguous territories that shared a dominant religion of Islam but were very different in terms of language, ethnicity and culture. In the 1970 parliamentary elections, an overwhelming number of East Pakistanis voted for a political party that advocated autonomy for the East, but it was blocked from governing by the Army and the existing Pakistani government, and its leader was jailed. The resulting mass protests in the East were brutally suppressed by the Pakistani Army, which caused a massive refugee movement into neighboring India. East Pakistani guerilla forces, supported by India, fought with the Pakistani Army in the late autumn of 1971. West Pakistan responded with air attacks on India, resulting in open war between the two powers beginning on December 3. The United States faced several dilemmas in how to respond to the crisis. The regional situation was already complex. India signed a treaty of mutual assistance with the Soviet Union in August, 1971, and the People’s Republic of China was friendly to Pakistan and had fought a war with India in 1962. However, Pakistan was a valuable diplomatic partner, and its government helped the United States achieve a rapprochement with the People’s Republic of China in the early 1970s. After President Richard Nixon’s visit in 1969, the U.S. Government had resumed selling Pakistan military equipment, a process that had been disrupted by the previous 1965 India-Pakistan War. Washington wished to avoid a second war between Pakistan and India, but also feared that Pakistan would be greatly weakened if its eastern province seceded, and so supported Pakistan initially. However, the action against the mass protests in East Pakistan was well-publicized and widely condemned, which limited the extent to which the U.S. Government was willing to help the Pakistani Government prevent the division of its country. In the end, the United States acted in a somewhat ambiguous manner during the brief 1971 war. The U.S.S. Enterprise carrier group from Vietnam moved toward the Bay of Bengal, stopping in Singapore and eventually reaching Sri Lanka. This action signaled to the Soviet Union and China that it was possible that the United States would assist Pakistan. However, by not ordering direct intervention, the United States also conveyed to both India and Pakistan the message that the U.S. commitment to intervention in South Asia had limits. This ambiguity would produce negative results for U.S. influence in the region. India’s relationship with the Soviet Union ensured that the United Nations would not intervene, and helped deter China from opening a second conflict on India’s northern border. Defeated on both fronts, Pakistan was forced to accede to the establishment of an independent Bangladesh in place of East Pakistan. Bangladesh was admitted to the United Nations in 1974. These developments resulted in a decline in U.S. influence in South Asia and India’s emergence as the most significant power on the subcontinent. 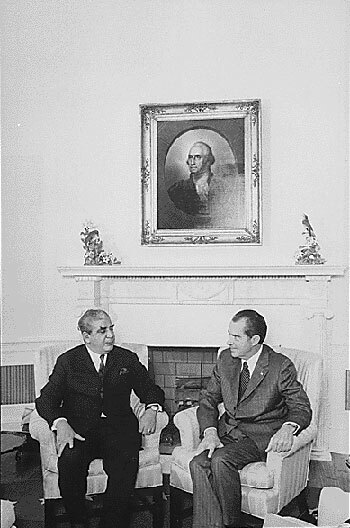 U.S. prestige was damaged in both nations, in Pakistan for failing to help prevent the loss of East Pakistan and in India for supporting the brutality of the Pakistani regime’s actions in what became Bangladesh. In contrast, the Soviet relationship with India became stronger, a fact that took on greater significance with India’s rise to prominence in the region. In the long run, the 1971 war increased competition between India and Pakistan, forcing the United States to maintain its focus on regional developments.